Assistant professor of psychology Alexa Veenema came to Boston College from the University of Massachusetts, Amherst, in the fall of 2010, as one of 31 new faculty members. Her focus of study includes the role of childhood stress on the brain’s release of the neural peptide vasopressin, which appears to play a part in modulating social behavior. In early 2011, Professor Veenema was awarded a Young Investigator Award from the Brain and Behavior Research Foundation (formerly the National Alliance for Research on Schizophrenia and Depression), which provides support for promising young scientists in the field. 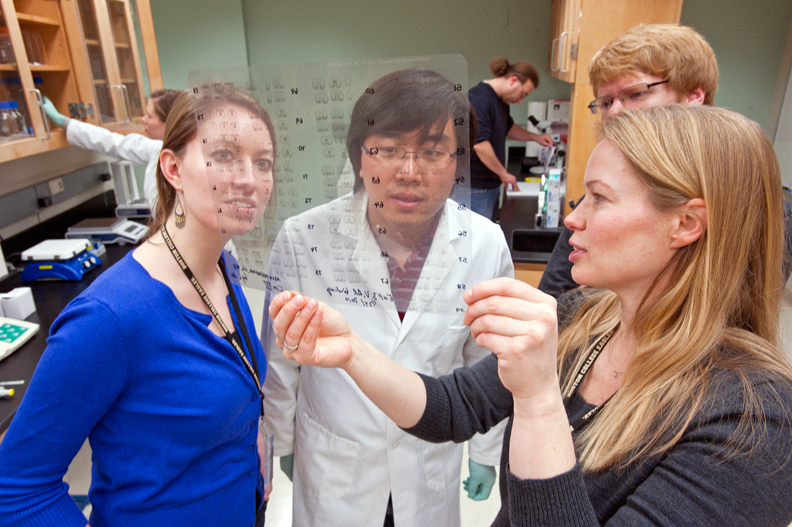 On March 4, Veenema (right) examined images of rats’ brains in her Higgins Hall laboratory with (foreground, from left) Kelly Dumais and Qingxuan Meng, both Ph.D. students, and Tom Mayer ’12. This feature was posted on Wednesday, March 16, 2011 and is filed under Featured Photo.